We write the year 1500. The Portuguese navigators reaching the new continent found the tree in abundance at the coast and its hinterland. It presented itself with a hard red wood adorned with thorns, and pinnate leaves, consisting of 9 to 19 small, leathery leavlets of an oblong shape. 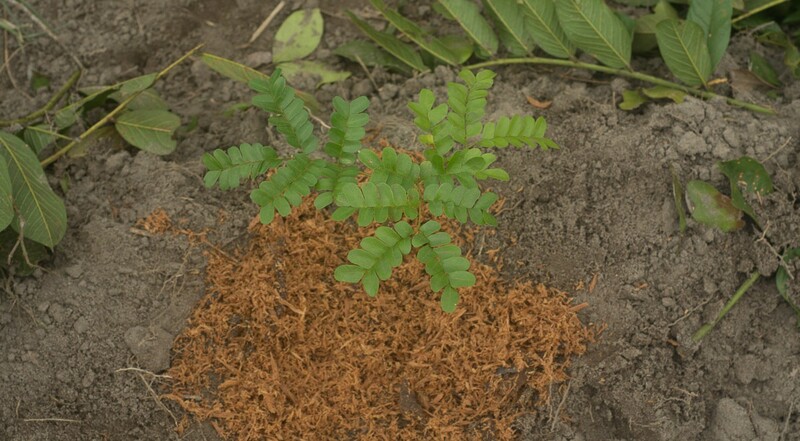 However, it did not take long until the colonisers learnt to use the tree officially named „Caesalpinia-echinata“, but better known as Pau Brasil. Literally it translates from Portuguese to “glowing wood”, referring to the tree’s intensely red bark and wood. It was this colour which made Pau Brasil a very valuable and popular dye at the time for different shades of red. The tree was so typical and economically important, that on many maps of the 16th century it stood symbolically for the Mata Atlantica Rainforest and eventually named the “Terra Brasilis” – current day Brazil. The Pau Brasil still is the national plant of the country. Here it also known as “Pernambuco”, named after the state where it used to be abundant. Unfortunately, this abundance has ceased to exist, together with much of the Mata Atlantica Rainforest. The Pau Brasil stands on the IUCN Red List of endangered species and is threatened by extinction. Some estimates put the number of the trees in the wild at less than 3000. Therefore, the trade with crude Pau Brazil wood is prohibited, much to the disapproval of the world’s producers of bows for musical string instruments. The wood of the Pau Brasil is said to produce one of the finest sounds out of violins, chellos and double bass. Thus, many bow makers who rely on Pernambuco for their livelihoods, have come together and founded the International Pernambuco Conservation Initiative (IPCI). This organization raises money to plant Pau Brasil trees on the coast of Brazil and donates seedlings to environmental organizations. The Pau Brasil Tree is on the IUCN Red List and close to extinction. The Pau Brasil seedlings we plant in our project stem from such a program. Our partner “Floresta Viva” has received more than two thousand IPCI donations and gave us more than a dozen to plant. We could have also used native Pau Brasil, which exists on this farm. But we use seedlings from different areas to improve the genetic material. We hope that our small national trees grow strong in the next years so that also future generations can enjoy the view of many Pau Brasil trees. And who knows. We might need the tree even more in the future. Some extracts have been tested as possible cancer treatments.